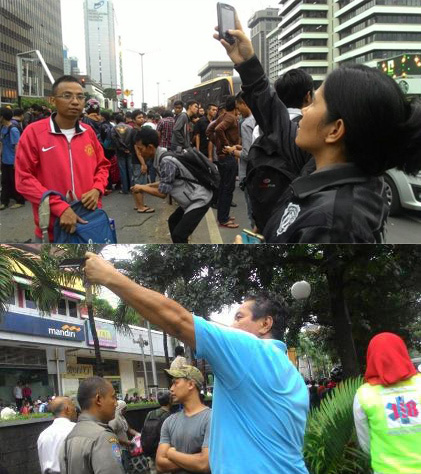 Terror group fired gunshots and explosives in downtown Jakarta, Indonesia on Thursday (01/14). Indonesian people fight back by taking the attention away from the terrorists, albeit unintentionally. Later she expressed her disappointment to find out that the officer is happily married with two kids: “SO it’s true. He’s married with two kids. That’s Indonesia, things can be too perfect ;’)”. 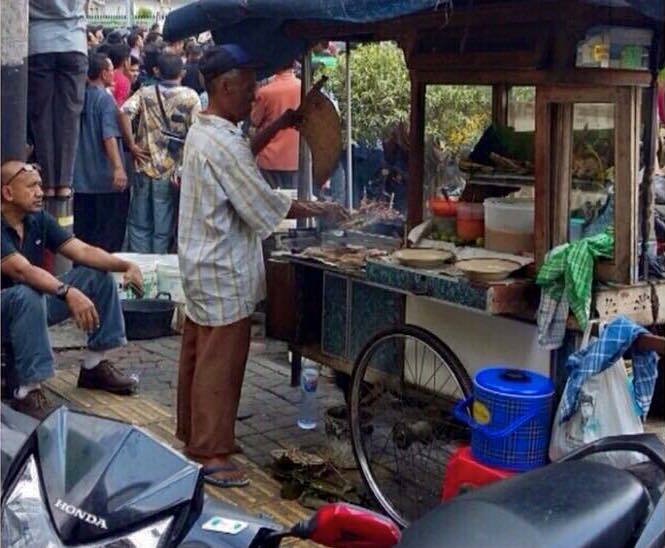 When interviewed by Kompas, the satay vendor decided not to leave the cart because they don’t want their satays (and the peanut sauce) to be looted. “When we heard the second bomb and saw people ran away, I was going to follow. 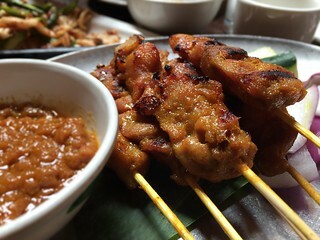 Then I remember my satays and I decided to stick around,” said Heni. Cigarette, bottled water, and steamed peanut vendors are making quick bucks from curious people who gathered a few feet away from the bombing site. Including the obviously thirsty police squad. Twitter user Frederic A. Ferry said that terrorists in Indonesia are “treated like nuts” which is a slang for “being ignored”. Twitter user @Bebiben joked if the ISIS commander saw how Indonesians are unaffected by the terror attack, he will cry in tears because his self-worth will drop to zero. 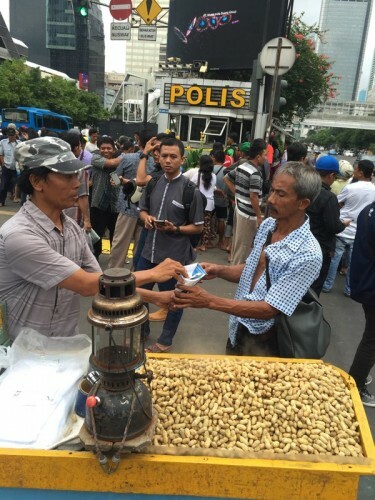 Other Twitter user Mega Simarmata said that bombs can explode, terrorist can hide, but street vendors can only be busy selling their goods. Rather than dwelling in fear and anger, like what the terrorists actually wanted. This is one of the largest terror attack in the world’s largest muslim country since 2009. However, people in Indonesia refused to be intimidated by fear and terror. They decided to laugh at the terrorists and move on with their life. WE ARE NOT AFRAID. Let me share this bro..
Harusnya setelah ini jadi lebih waspada sih, dan kalau aku diposisi mereka, lebih milih menyelamatkan diri daripada nggerombol. Ya kita ga pernah tau apa yang bakal terjadi kemudian. This is jakarta!! 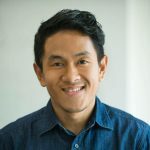 Tiap hari dimana kapanpun udh banyak kriminalitas ???? This is Indonesia !!! Strong Country !!! My sympathy for the people who lost loved ones. You guys got guts . Cool . Well Done Indonesia! Long Live President Jokowi. Ciayooo Jakarta!!! Let us from now on All Jakarta residents & Indonesians Join in Unity to protect & keep our own cities protected & Safe. Report to local Satpam & Hansip for any suspicions in neighbourhoods. Let’s RT & RW and the residents work together in Unity to protect our homes. The People must be Bold too.. Thank you to All the Police & Secret Agents that had been in the front line..
Isn’t taking selfies & carrying on about an officer’s looks or clothing more incentive than sticking it to IS? I lived in Jakarta for 4 years,,and travelled around Indonesia,,, indonesian people are the friendliest and toughest people I have met anywhere in the world,,,what they did yesterday was truly amazing! 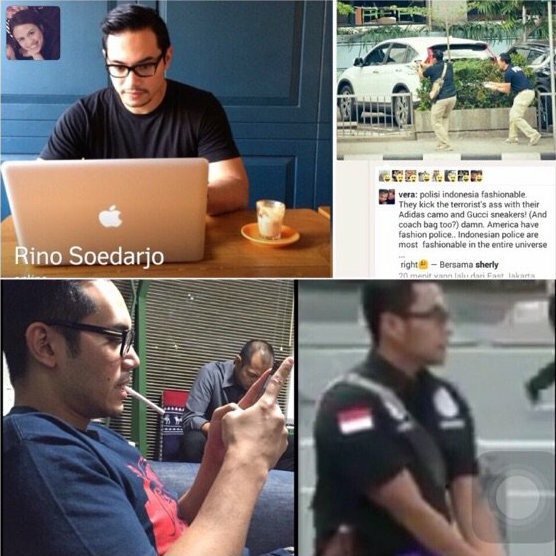 The police officers were brave and fantastic, serving their public,,,true hero’s ,, the public are so unimpressed by these thugs,,be PROUD Indonesia be VERY PROUD, the world is impressed! Truly amazing! GBU you all, Amin. The handsome policeman actually wear not the same shirt -uniform like the others policeman.. 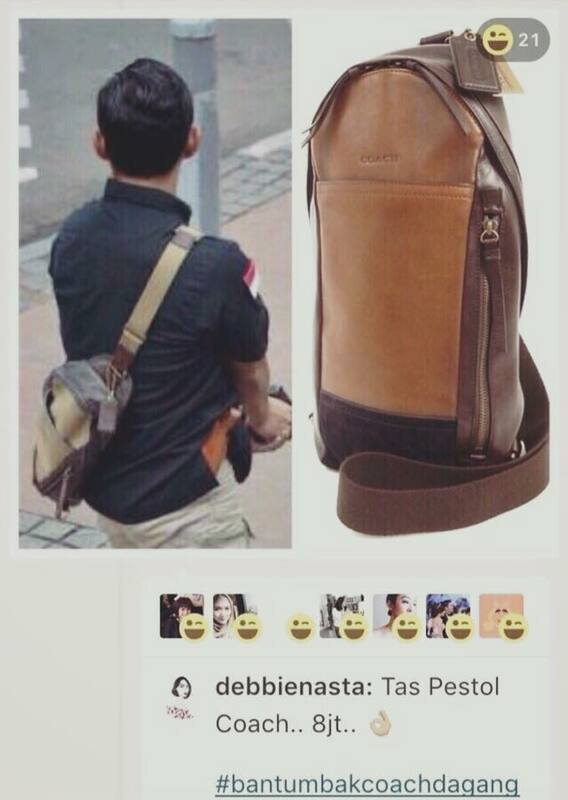 There is no label POLISI in his back. So i doubt it he is the police crew. I think it was a trick of social media. Dev : the handsome policeman is the real policeman. He is an agent. Waaah, akhirnya ada postingan baru! I agree. It’s kind of unique yet amazing to see what happened yesterday around the bombing venue. Only happens in Indonesia ! People are tough and brave. However, in future we should be more careful and vigilant. Great project idea, I am a big fan of washable bathmats. Those rube-rbbacked ones always gets smelly and mildewy eventually (even if you don’t have cats peeing on them!) and they don’t do very well in the washer. I like your idea for using kid art for the quilting. It reminds me of some of the bed sheets that my grandmother still uses – she let my toddler-aged mom and her brothers decorate them with markers! It’s not a failure when people are dead and injured. Its not strength, its ignorance. It’s so called immune. 350 years under dutch occupation (terrors), 3.5 yrs under Japanese occupation also brought immense terror. War against communism (after 30 sept 1965) nearly 1 millions were hunted, tortured and killed in revenged to communists (not officially documented). After reformation, since 1999 until 2009 we were attacked by much bigger bombs with hundreds of ppl died. 1) bombing at the gate of Philipine’s ambassador residence in 1999 the tremor could be felt kilometers away;2) Stock exchange bombing at the 2nd basement of parking lot,hundreds of ppl trapped and died but not well published;3) JW Marriot bombing;4) Australian embassy bombing 2009, hundreds of ppl died too;5)Ritz Carlton bombing. not to mention 1998 coup. if we bowed down to terror and hid we wouldnt hv survived. we’ve been through lots, too much. perhaps you can use Vietnam as comparison. Vietnam people are extremely tough and just like us they choose to move on with lives instead of crumble. Open letter to the terrorists : EEK LU!!!! Great Jakarta, Great Indonesia. F… Off ISIS. You guys are praising the incompetence of the police/army to close a crime scene? What if another terrorist blows himself up in the midst of such a dense crowd of onlookers? Freaking amateurs, both on the police and terrorist side. The only thing Indonesia has got going is its worthlessness and lack of priority for terrorists. Wrong time terrorist..we’ve just had enough noise from new-year-eve’s fireworks so the boms were only like “The New Year Eve II” or “The New Year Eve Returns”. Lets celebrate with makan-makan…Bang satenya 200 tusuk..! B, it’s always so easy to criticize anonymously in front of your computer screen when you gave no contributions whatsoever. As bad as our Police Department is, the Indonesian people fully supports them in times like these because they are the one we can turn to and not people like you who have lots of opinion but not solution or action. RESPECT! Keep calm & stay strong Jakarta! I love Jakartans, I love Indonesians. Hi! This is my first time visiting your blog. This zucchini dip looks and sounds deiusloic! I just recently discovered how much I love zucchini! Thank you for sharing! euh…un arbre gÃ©nÃ©alogique gÃ©ant? des marque-places?Quoi que ce soit ils sont super mignons! !Il n’y aurait pas de nouveaux mugs au planning par hasard?Kallou : une envie particuliÃ¨re pour les mugs (c’est vrai que Ã§a fait longtemps que je n’en ai pas fait!! The street vendors doesn’t have much choice. They run away at that moment, they can live the day safely, but have less to eat and give to their families. That’s why they choose to stay, maybe they all thought the same thing that day. “I’d better dead than give nothing to my family (and lost my cigar money)”. Jakarta keras sob, lebih keras dari teror ISIS. itu yg nonton + orang jualan pada gak takut ya kl kena bom ? jika saat disitu saat kondisi setelah pengeboman, lebih baik saya pergi pulang menyelamatkan diri, dibandingkan harus ikut liat bergerombolan. cukup liat di tv saja lah yaa.